Here is the second card my guests made this weekend at my Open House. This was a CASE from the catalog page featuring these sets: C is for Cat and D is for Dog. I modified it only slightly! I also gave them the choice between the cat and dog since many people prefer one over the other! Both sets are adorable and a great addition to any stampers collection! Card base is So Saffron, folded in half the long ways (cut your 8-1/2 x 11 CS in half to be 4-1/4 x 11). Stamped at the bottom on the Dog one is the bone from the set, and on the Cat one the fish. The paw from the Cat set fits perfectly on a Build-A-Brad! Hadn't used those for awhile! The Old Olive is layered across with a Real Red strip under. 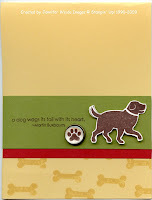 The cat or dog was stamped in Chocolate Chip on Whisper White and cut out. The paw is punched with the 1/2" circle punch and adhered to the brad. The dog or cat was attached with dimensionals. Thanks again to all of you who came this weekend, either here or to Beatrice. Two fun days!! I hope to do it again soon!! LMK if you have questions on anything that we did! We did 4 cards in all. The Elegant Eggplant card from this post was the 3rd one, and the 4th is being featured on the Blog Tour next weekend. I will be showcasing the Autumn Days set so make sure you stop by! A Blog tour is a bunch of blogs linked together, in this case showcasing samples for new sets from the catalog. Details are in my sidebar. You can come here, then click there or bookmark that site as your starting point. There are 4 sets of 20 blogs, so block some time off Sunday, Monday &/or Tuesday to make the rounds! I'm glad to hear that your Beatrice open house went well! I'm really looking forward to you doing more open houses - or maybe even classes - hint, hint! 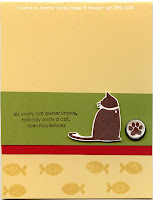 Love your Dog and Cat cards! The build a brad with the paw is adorable! I had a great time at the Open House and was very pleased with the cards we made! They are beautiful! I was so happy to learn how to stamp with bleach. I'd tried the bleach pen technique and never could get it to work. Your cards are always so beautiful and I like having yours around to use as inspiration. Also, the new catalog is great! I am happy to see that SU! has gone with some more 'realistic' looking stamps and not everything is 'cutesy.' I have a huge wish list! Thanks again for inviting me to your Open House.